If you are a county lister and often ask "What county is that bird in?" then this file is for you. In this day of high-tech devices available to ordinary citizens, there is no reason why listing boundaries can't be precisely codified in map form so that when you are in the field you can know when you cross over the line. This is my first stab towards that end and I consider Phase 1 complete. 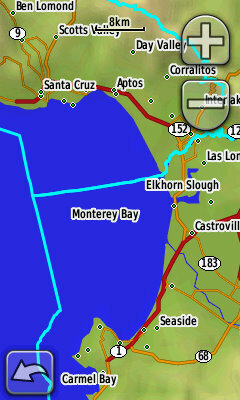 In this file you will find county boundaries for all of California's counties and offshore islands out to 3nm. The data come from two sources. The first source was more precise and the second source drew the county lines to the 3nm buffer. I really don't know the provenance of the first coverage but I got it from Pablo Herrera and it is more precise because it more closely follows the old thalweg of the rivers and creeks which defined the counties in the 1800's. It also follows the ridge-lines more closely in those instances where ridges define the boundaries. The second source was downloaded from Tiger Line which is curated by the Census Bureau. I opted to use this for the coastal counties because it continued the county line offshore to the limit of what is deemed county jurisdiction. Actually what I have done is retain both versions, so that is why you will find two shapes for all the coastal counties. Each island group also has their own shape. Note that the shapes in the Census Bureau data-set contain some errors. When you find errors, I would like these brought to my attention if you think they deviate more than 30 meters from reality. I am currently working on taking the county lines further off shore. My goal for Phase 2 is to take them all the way to the 200nm limit. This file is in GDB format. It is a format which you can use to load spatial data into Garmin's MapSource software and then into their GPSs. If a GDB file doesn't interface with your favored GPS interface program. I'd suggest downloading GPSBabel which is a file type converter. It surely will have what you need for turning it into a format which you can use. Once the file is loaded to your GPS, these images (right) are what you can expect. *Note:* The Garmin to have is one of the Oregon models. It is capable of holding 200 different counties. Be aware that the Colorado models can only hold 20. As can the old 76CSx. 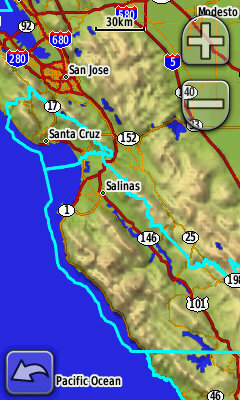 California County Lines - including offshore (3.8MB) 8 Dec. 2009 version.